In this post we will see how to create Unit tests for Asp. Net 5 (vNext) projects. First of all Let us see what is xUnit? 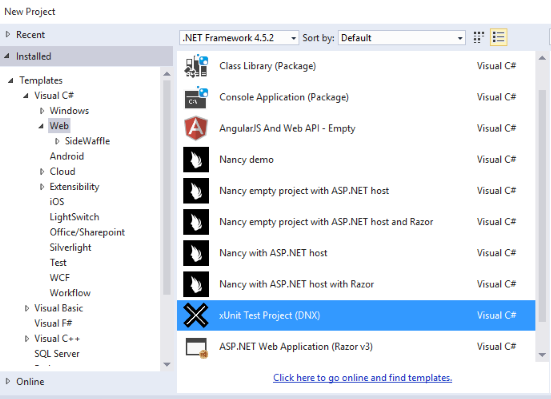 xUnit.net is a free, open source, community-focused unit testing tool for the .NET Framework. Written by the original inventor of NUnit v2, xUnit.net is the latest technology for unit testing C#, F#, VB.NET and other .NET languages. You might be thinking why we can not do just “Add New Project -> Unit test project” for vNext? No not yet but yes we can! Well there were not any templates supported to create Unit test in vNext until we had newly added templates in SideWaffle. The SideWaffle extension adds a bunch of useful Snippets, Project- and Item Templates to Visual Studio. The purpose is to make your daily work in Visual Studio a richer and more productive experience. Got it, How to get SideWaffle? You can directly install it from here. Now you can directly select template for Unit tests. File->New Project and navigate to the web node. From there you should see the following list of available templates. Now you are all set to write your first method of Unit test in vNext. Suppose you have method in your AccountController class which validates that User is authorized or not. // This project can output the Class library as a NuGet Package. // To enable this option, right-click on the project and select the Properties menu item. In the Build tab select "Produce outputs on build". You can check your results in Visual Studio. You can build your solution and then open Test Explorer to see the test cases. That’s it! You can add Unit tests in vNext. And do you have any news about test coverage in ASP.NET 5? Hi Juanperez, I guess you mean code coverage! According to my knowledge currently there is “OpenCover” for generating code coverage, “Coveralls” for publishing the code coverage publicly, and “ReportGenerator” for generating local code coverage reports.